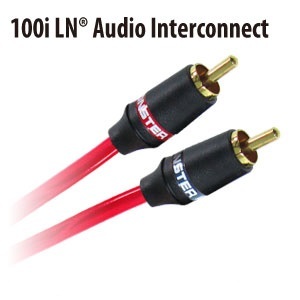 High quality car audio interconnect delivers improved sound at an affordable price. Your car audio can’t perform its best without high quality cable. No matter how good your system is, it can only perform as well as its weakest link. Don’t let the weakest link in your car audio system be the interconnect cable connecting your components. Ordinary interconnects can actuary degrade sound quality, restricting dynamic range, limiting frequency response and increasing distortion. Inferior shielding can’t adequately reject radio frequency (RF) and electromagnetic (EM) interference that cause like buzz and hum. 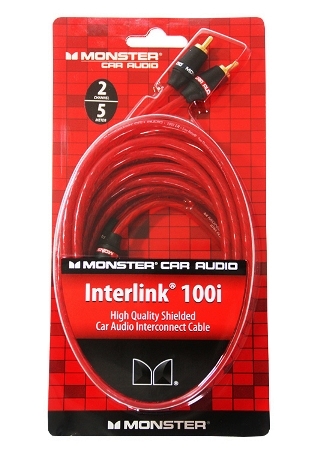 Monster Car Audio Interlink® 100i: Legendary Monster® technology and performance at an extraordinary value. Interlink 100i is specially designed to transfer complex music signals, while minimizing cable distortions. DoubleHelix™ conductors with XLN® Xtra Low Noise® construction deliver music the way music was meant to be heard: broader soundstage, more accurate imaging, improved clarity and deep, tight bass. Monster’s special low density dielectric insulation helps prevent frequency loss. I100i features a 100% full coverage foil shield which provides superior RF and EM noise rejection, so you’ll hear music with maximum clarity and no annoying buzzes or hums. And I100i’s ultra-cool, transparent red Duraflex® jacket resists abrasion and temperature extremes for maximum reliability, whether you’re installing a new stereo system in your ca or upgrading your current system, Interlink 100i will help your components deliver the best possible sound. Take your car audio system’s performance to the next level. Interlink 100i reveals those important musical details that were previously buried, delivering your favorite recordings with stunning power, clarity, and definition. Pick up I100i today, and discover your system’s true performance potential.